Having the content of a presentation adapt to the needs, resources and prior activities of a user can be an important benefit of electronic documents. While part of this adaptation is related to the encodings of individual data streams, much of the adaptation can/should be guided by the semantics in and among the objects of the presentation. 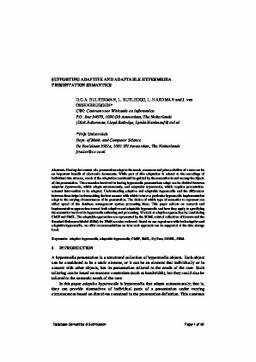 The semantics involved in having hypermedia presentations adapt can be divided between adaptive hypermedia, which adapts autonomously, and adaptable hypermedia, which requires presentationexternal intervention to be adapted. Understanding adaptive and adaptable hypermedia and the differences between them helps in determining the best manner with which to have a particular hypermedia implementation adapt to the varying circumstances of its presentation. The choice of which type of semantics to represent can affect speed of the database management system processing them. This paper reflects on research and implementation approaches toward both adaptive and adaptable hypermedia and how they apply to specifying the semantics involved in hypermedia authoring and processing. We look at adaptive approaches by considering CMIF and SMIL. The adaptable approaches are represented by the SGML-related collection of formats and the Standard Reference Model (SRM) for IPMS are also reviewed. Based on our experience with both adaptive and adaptable hypermedia, we offer recommendations on how each approach can be supported at the data storage level. Bulterman, D.C.A, Rutledge, L, Hardman, L, & van Ossenbruggen, J.R. (1999). Supporting Adaptive and Adaptable Hypermedia Presentation Semantics. In Proceedings of the 8th IFIP 2.6 Working Conference on Database Semantics 1999 (DS-8): Semantic Issues in Multimedia Systems.